Generally, a proxy is a program or device that is used as an intermediary, to intercept all the traffic between clients and the internet. Proxies can be used as a content filtering mechanism in corporate environments, to protect privacy for example. Since Netsparker is used in such environments, it is necessary that these settings are configured in Netsparker as well. From the Proxy tab, you can select to use the system or custom proxies, or to use none. Netsparker will use the selected proxy for connecting to target websites and to receive updates. This table lists the Proxy options. Select to use the System Proxy. This is the default. System Proxy is the system-wide proxy which is used by every program by default. Select to use and configure a Custom Proxy. 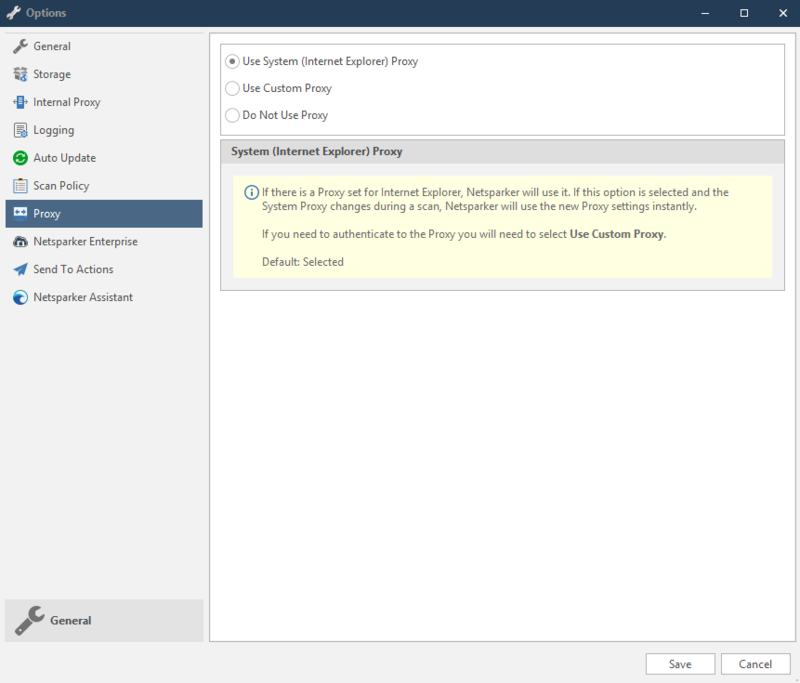 Custom Proxy should be configured explicitly to be used unlike System Proxy. No Proxy will be used. Select the relevant Proxy option.